I first dipped my toes into Ayurveda as an extension of my yoga and meditation practice. I was looking for a complete experience of vitality, optimal health and well-being, and lots of energy. My first intention was to go into Ayurveda School for my own personal vitality, but as it turns out, I fell in love with sharing it with others, too. With Ayurveda, we have this container around us, or as I like to call it, our capacity. Without a strong container, the ways in which we take care of our health–exercise, meditation, yoga, and a healthy diet–just flow in for a bit of a boost and then flow right back out again, without much long-term benefit. Without a strong container, we can do everything right and still find ourselves off-balance. We can rise with the sun, go for a walk, drink our lemon water, scrape our tongues, have a meditation session and perform asanas, but can get in our car and encounter traffic and still become completely disrupted and aggravated. What Ayurveda does is strengthen our container. It extends our capacity, our radiance, and our potential, so that external factors don’t hit us as hard. Of course, we’ll always encounter inconveniences, but in the long run, they won’t throw you off and ruin the rest of your day. Ayurveda is incredibly simple, and unlike so many other systems of health, it doesn’t demand perfection from you. You can incorporate Ayurvedic principles and practices four out of seven days of the week. We don’t want to be feverish and do everything every day! That’s not sustainable. Incorporating Ayurveda is as simple as finding a few practices that really resonate with you, and then building upon it as you continue your journey. The essential first step of Ayurveda is finding your dosha, or constitution, and beginning to incorporate the recommended diet habits associated with that dosha. Our diet is the foundation of our Prana, or our life force energy, and so much of imbalance, disease, and physical and mental unwellness stems from poor digestion. Start with three meals a day.Fine tune and tweak these meals to be more pacifying to your dosha, and you’re already off to a great start. The second step I’d recommend is looking at your sleep habits. Make your bedroom a sanctuary–no computers, TVs, or cell phones; a comfortable mattress; curtains that close and create a nice dark room. Get a good night’s sleep and rise with the sun, and you’ll have more energy throughout the day. Just by incorporating these two basic things, you’re practicing Ayurveda. Ayurveda recommends a seasonal cleanse every spring and fall, because wisdom dictates that it takes six months for disease to accumulate. During winter, we store toxins in our fat. When it starts to warm up, these toxins are released. That’s why so many people are more vulnerable to sickness in the springtime! A spring cleanse flushes these toxins out and bolsters our health. In the summer, we accumulate heat in the blood, which can also manifest in disease. We dispel that heat when autumn moves in, and a fall cleanse can help support your body in that process. Each cleanse eliminates these toxins in a very gentle, nurturing, and highly effective way. We’re resetting our digestive fire, which is thrown out of balance from stress and a low-quality diet. Cleansing also gives you an opportunity to reset your relationship with food in your habits and behaviours. It’s gentle, nurturing, and nourishing to mind, body, and soul. I do a lot of Ayurvedic consultations with predominantly women, and one of the major focuses for this group seems to be finding and maintaining an ideal weight. The media goes wild promoting the latest weight-loss fads, but many of these fads are counterproductive to our digestive system. Extreme diets actually diminish the digestive system’s capability to support and maintain an ideal weight. While we may lose weight quickly in the present, we’re destroying our body’s ability to maintain a long-term healthy weight. Weight loss is actually pretty simple. We bring our weight into balance by eating the right foods at the right times and in the right quantities, and by doing the right amount of exercise. There are, of course, some constitutions where eating lightly serves you, and other constitutions where a gentle diet of kichiri once a week to reset the digestive system is satisfying and nurturing. But that’s the wonderful thing about Ayurveda–your ideal health is always dependant on your individual needs and constitution. Ayurveda resets your relationship with food. Most of us deal with a lot of stress, and we tend to deal with it in two different ways. Either we skip meals and have no interest in eating, or we overeat out of a desire for comfort and groundedness. Both of these cases are detrimental to the digestive fire. Ayurveda helps you learn how to manage stress and your relationship with food, to rewire it so that you perceive food for what it is: nourishment. We are honored to hold space for you to begin your journey to health, happiness, and balance with Ayurveda. 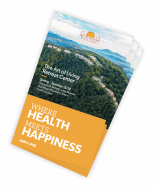 The Art of Living Retreat center offers personalized consultations, retreats, and treatments – check out our catalog or call 800-392-6870 to find the right program for you. Kimberly Rossi, director of Shankara Ayurveda Spa, has been studying, practicing, and teaching Yoga, Meditation, and Ayurveda classes and workshops for seventeen years. Kim is a Kripalu Ayurveda Counselor. A certified yoga teacher and Ayurvedic practitioner, Kim believes these paths assist us in being the very best version of our self.